Do you want a new dessert for your care home menu? Try out this twist on a classic posset, with the added sweet fruit compote at its base and topped off with a fine toasted pistachio dust. It can be served as small shots for those residents who need calorie recovery or build up. Pipe the Carte D'or Raspberry Coulis into the ramekins to a depth of 1cm. Place the ramekins in to the freezer togive a solid layer on which to pour on the posset mix. 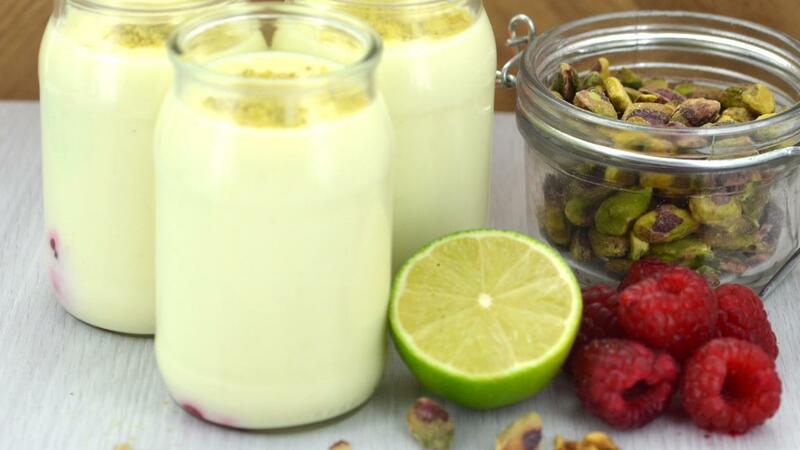 Blend the pistachio nuts into a fine powder then put in an air tight container. Place the MEADOLWLAND Double in a pan add the sugar, milk powder and bring to the boil with the lime zest for 3-4 min. Pour the posset mix through a sieve to remove all of the zest, then whisk in the lime juice. Allow to cool and carefully pour into the ramekins. To serveadd the pistachio powder to the top.